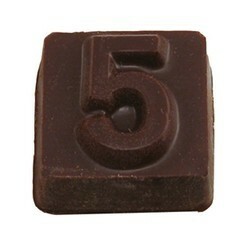 Custom molded solid chocolate candy number squares. Available in dark, dark mint, milk or white vanilla chocolate candy. Available foil wrapped or in a cello bag tied with a bow. Imprinted label applied to wrapper or bag.Makes a great food gift or trade show giveaway.